I've always been a big fan of incorporating movement into all learning, and especially in the elementary music classroom. Now I think it's a necessity for survival (the students' and mine)! I've compiled a list below of some of my favorite movement activities that I am using in my classes right now, and I hope all of you other teachers out there will add to the list in the comments here or on my facebook page! This one is the most simple but also can be the most fun! I keep a playlist in my iTunes that is full of upbeat music with a strong pulse. Any time I think the students need it, I announce that we are having a dance contest. This might be when the students first walk into my room, in the middle of my lesson, or even at the end when we have some extra time (or I can just tell their brains have exceeded maximum capacity). I tell them I will be awarding points for creativity and appropriateness, call a small group of students to go to the open area in my room, and start the music. After a minute or two, I call another small group, and I make sure everyone has at least two turns. With the older students, I will switch the music to a different style or genre to see who is able to change their movements to match the music. 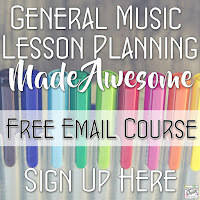 Although the #1 goal with this activity is purely to get students in a positive mindset, get the wiggles out, and give their brains a little break, it does help teach some important musical skills like developing their movement repertory, distinguishing musical genres and characteristics (as they demonstrate through the appropriateness of their movements), and keeping a steady beat. Form: use a different movement (usually with the beat) for each section. This is especially helpful for music with a repeating section (such as rondo form) because the students remember repeating that motion each time. Dynamics: crouch down on the floor when it's quiet, and stand up tall when it's loud; tip-toe when it's quiet, and stomp when it's loud; scurry like a mouse when it's quiet, and march like a lion when it's loud (and of course there are gradations of each). Meter: emphasize the downbeat/strong beats in the time signature with a larger movement. For a fast 3/4, for example, you could take a big step on beat 1 and clap (or take tiny steps) on beats 2 and 3. A simple sway with the whole body or the arms on the downbeat is also effective. Mood: "act out" feelings portrayed in the piece with facial expressions and body language. This is fantastic if you have a piece that switches modes, especially between major and minor. Tempo: walk with the beat. Just to state the obvious. Timbre: pretend to play one of the instruments you hear, or assign an animal to prominent timbres and move like them (e/g/ bird for flute, elephant for tuba). Articulation: hop for staccato and glide for legato, or point with your fingers for staccato and sway your arms for legato. Pitch: move low to the ground for low pitch, and stand tall with arms up for high pitch. This is especially good in a song with some big leaps. I also introduce solfege by having students move up and down with the pitches in "Do a Deer", which gets to be pretty funny by the end (do re mi fa sol la ti do, sol, do!). Cups: Ever since the cup song we can't get enough of cup routines! Cups are a great way to show the beat (passing in a circle on the beat), form (do a different routine for each section), and meter (pass on every downbeat) with a recording. I also use them to practice new rhythms. Doing a rhythm in a cup routine can break up the mundane clapping practice! I've also had great success with older students creating their own cup routines. I usually assign a particular rhythm that has to be incorporated into their set, and they will perform them for each other. Scarves: Nothing beats scarves for "soft and flowy" music! Scarves are a great way to get students (especially boys) to use more graceful movements if you tell them to move their scarf with the music instead of their bodies. I have 5 lines permanently taped on my floor, so that I can do a quick round of "letter name relay" whenever the mood strikes. I split the class up into teams, and each team lines up behind the first line of tape. I call a note letter name, and the first person from each team races to get 2 feet on the correct line or space for that letter. You should see how intense the competition gets! Then I have the students try to "expressively conduct" a different piece of music. I tell them they have to stay in one spot on the floor- that is the only direction I give. It's amazing to see what they come up with when I challenge them to do better than the toddler! 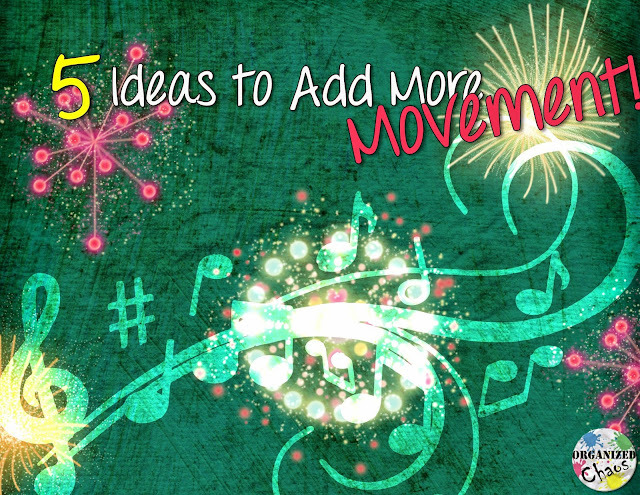 I hope you find some new ideas here to incorporate into your music classroom. Adding more movement activities can make a huge difference during pre-vacation season, testing season, or any time of year! Please do share your own ideas in the comments here or on facebook! I love how your ideas are descriptive and detailed, yet simple and easy to implement! Thanks for sharing these. Great ideas! 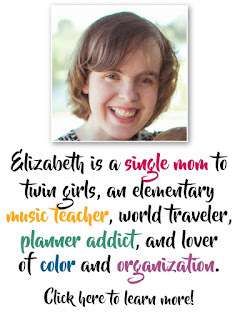 Movement is such an important part of what I do, especially as someone who specializes in Orff Schulwerk; Music and Movement Education! I couldn't teach music without movement. Thanks again!